Steve has educated hundreds of building and related industry professionals over the past 8 years including home builders, remodelers, building and trade contractors, architects, interior designers, occupational therapists, physical therapists, university faculty, insurance agents, attorneys, building materials suppliers and manufacturers, physicians and other healthcare professionals, durable medical equipment providers and installers, kitchen and bath designers, decorators, and more. The release went on to explain the impact his training has had and some 80-course offerings of the 3-class CAPS designation program presented through the end of 2015. Steve conducts most of his classes in West Palm Beach, Florida, but has presented them in Las Vegas at the Builders Show, in Bath, Maine, in Lecanto, Florida, and an upcoming session in Hartford, Connecticut. With an Instructor’s License issued by the NAHB, Steve has the ability to present these and other sales and marketing classes, including the 2-day Universal Design/Build program, on demand anywhere in North America. 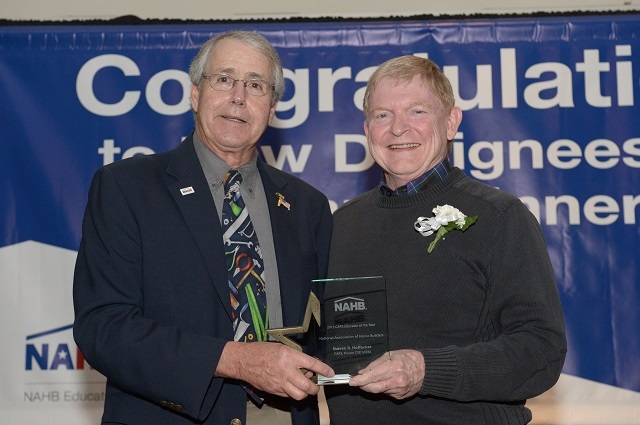 2015 NAHB Education Chair Tom Stephani (left), CAPS, CGP, CGR, GMB, and MIRM, presents the NAHB 2015 CAPS Educator of the Year Award to Steve Hoffacker, CAPS, MCSP, MIRM in Las Vegas in January. Learn more about the CAPS program and Steve classes at stevehoffacker.com.